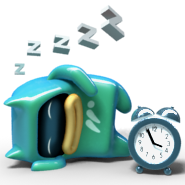 If you want to set a sleeptime by simply pressing a remote button, this plugin is what you are searching for. It is possible to define the steps which are used to set the sleeptime and detects the remaining playback time if a media is played while you pressed the sleeptimer button. If you are using IRSS, there is NO need to configure the remote button mapping within MP, since IRSS detects the sleeptimer plugin and always sends the yellow button if the plugin is found. There is also an usefull auto activation feature where you can set a time (HH:mm). When the time has come MySleepTime activates itself.